How to buy the best vinyl siding, with consumer report on vinyl siding trim and channels and helpful exterior vinyl detailing illustrations and diagrams. 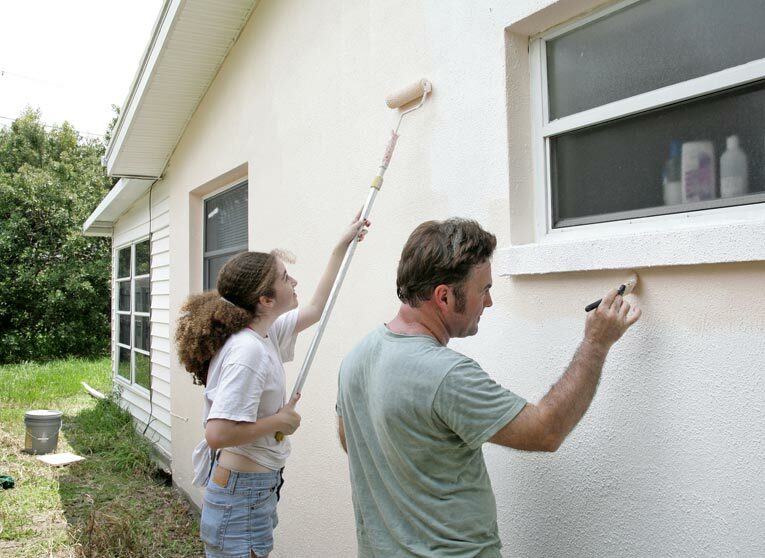 Vinyl siding is an extremely popular siding material, no doubt because of its relatively low cost, durability, and ease of installation by do-it-yourselfers with only moderate skills. Like other manufactured siding products such as aluminum or composites, vinyl can be applied over existing siding such as masonry or wood to give a house an entirely new look. 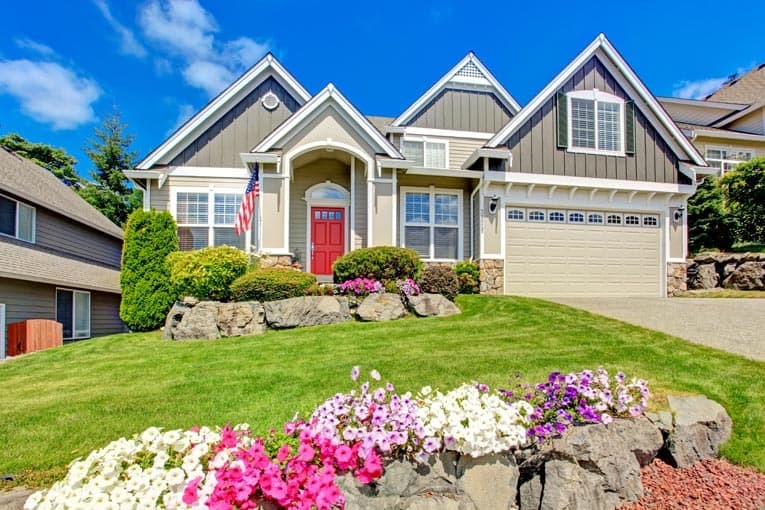 Extruded from polyvinyl chloride (PVC), vinyl siding counts among its many virtues that it weathers well and is far more resistant to insect damage and dry rot than wood (though these problems can occur in the materials under the vinyl siding). It also does not need to be painted or caulked. With proper care and maintenance-usually just an annual hosing down-it can last from 20 years up to the life of the home. Because vinyl siding can fade with long-term exposure to the sun’s UV rays, it has traditionally been offered only in white and light colors, which show fading less. Thanks to recent product advancements, however, many manufacturers now offer a selection of moderately dark tones with reasonably good color retention. Vinyl siding is available in a variety of textures, ranging from matte finishes to deeply embossed wood-grain surfaces that simulate wood clapboard siding. Most vinyl siding is made to mimic the look of wood siding. From a distance, it can be quite convincing, but on close inspection it still has the appearance of vinyl. Several different profiles, or panel types, are manufactured. Most are designed to be applied horizontally, but board-and-batten patterns of vertical siding are also among the offerings. A few of the key vinyl siding profiles include 12-foot, 6-inch-long horizontal panels that look like double 4- or 5-inch boards, triple 3-inch boards, single 8-inch boards, Dutchlap siding, and more- decorative scallops, shingles, and shakes. Vertical panels generally have a board-and-batten appearance. In some situations, vertical siding is used in combination with horizontal siding; for example, the lower part of the wall may be covered with horizontal siding but the upper sections may have vertical siding. To ensure quality of products made by major manufacturers, the Vinyl Siding Institute offers a certification program that ensures products meet or exceed industry standards, expressed as “ASTM D3679.” This designation ensures qualities such as the ability to weather and retain color, resistance to wind-load impact, and other manufacturer claims. Vinyl siding installation requires a variety of special strips and channels that are designed to secure the siding panels to house walls and capture the cut ends of the siding. These include corner posts, starter strips, J-channels, and similar attachment and trim pieces. 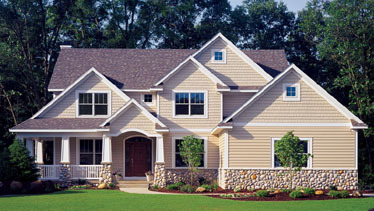 Most vinyl siding manufacturers make two or three sizes of J-channel. For vertical siding, these channels typically have openings of 3/8 inch to 1/2 inch to receive siding panels and soffit materials. 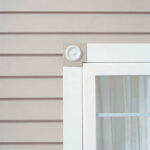 For horizontal siding, J-channels with openings of 3/4 inch to 1 inch are commonly used. When ordering these channels, be sure to match them to the siding pattern to ensure a snug, weatherproof fit. 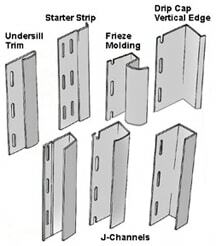 Other trim and moldings used to accessorize and mount vinyl siding include starter strips, F-channels, drip caps, inserts, and trim. They are designed to give every installation a finished appearance and make all joints weather-resistant. When vinyl siding is installed on a house, special vinyl corner post pieces are utilized to provide weather-resistant, good-looking joints at both inside and outside corners. At inside corners of a wall, where vinyl siding meets from two adjoining walls, this accessory provides a weather-resistant joint. The siding fits neatly in the channels extruded along the length of these posts. These corner posts are manufactured in a variety of sizes to accommodate all types and configurations of siding. In some cases, two J-channels, installed with corners together, substitute for an inside corner post. 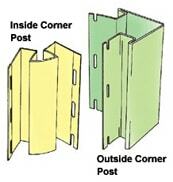 These corner posts are designed to provide a neat, weather-resistant outside corner on house walls. These, like inside corner posts, have channels for receiving the siding and come in appropriate widths for all types of vinyl siding. Alcoa, CertainTeed, Wolverine, and other major manufacturers of vinyl siding produce vinyl details that give pedestrian siding systems a classic look. Some of their offerings include window and door surrounds, shutters, corner posts, dentil molding, and a range of other components, as well as decorative custom shingle and siding patterns. For example, Alcoa Building Products’ line of Images Designer Accessories includes accent panels in four fish-scale patterns, wainscot, dryer vents, and fixture mounts. These decorative accessories are available in a wide range of colors and can be used with vinyl and aluminum siding, brick, and stone. CertainTeed has gone to great lengths to create trim that mimics the look of wood. Wolverine also offers a realistic line that includes a premium, super-rigid soffit; fish-scale, beaded, and lattice panels; extra-wide fluted, stepped, or smooth corner posts; and stepped window trim. If your home is sided with aluminum, you may be able to use some vinyl specialty parts; otherwise, you can get custom-bent aluminum pieces for some architectural features, but these tend to be expensive and not very authentic looking.